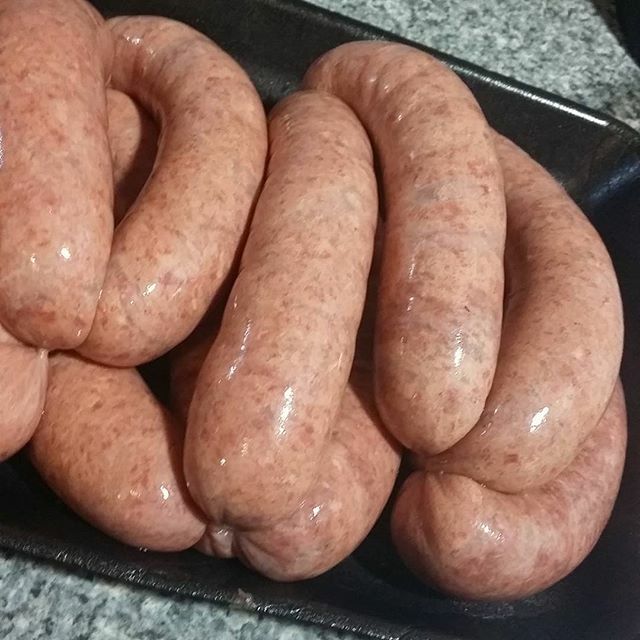 Make your family juicy thick or thin beef sausages from locally sourced, good quality meat. This recipe is a basic sausage recipe that is ideal for beginners. Once you have mastered the sausage-making technique, the possibilities are endless! You will also need thick or thin sausage casing/s and a sausage stuffer/funnel. A mincer is helpful but optional. Sterilise all of your equipment in hot, soapy water and rinse well before use. Also prepare casings once the meat has been weighed – soak natural casings in water for one hour, then rinse and flush with water to remove salt. Place casings in a bowl of water with a capful of white vinegar to keep them moist while preparing the sausage mixture. Store meat in the refrigerator in a covered dish during preparation, taking some out to cut as required and returning the meat to the refrigerator as quickly as possible to limit bacterial growth. Once you have chosen your meat, place it into the freezer for around 15 minutes or until firm enough to cut. For whole meat cuts (i.e. roasts), slice into steaks and reserve any fat to weigh separately. Pork fat has a milder flavour than beef fat, so is the most common fat added to sausages. Cut meat into strips wide enough to fit into your mincer. Weigh meat to determine final batch yield. For your first batch, 80% meat and 20% fat (or 70% meat and 30% fat) is ideal. Chilled meat does not clog your machine as easily. Mince on large then medium or fine as desired. Fat can be minced with the meat, or separately. If you don’t have a mincer, you can order mince from your local butcher instead. Combine the minced beef, minced pork fat, salt and pepper together. Sausage filling should be moist, not dry – add a little water if you like. You don’t want the mixture to be too wet that the liquid seeps from the sausages as they are made (because the excess moisture also removes some of the salt). Ensure sausage mixture stays chilled at all times and all equipment is kept clean. Mix 24 hours before filling links for a better flavour. Cook a small handful of mixture to check seasoning before stuffing, if desired. Load prepared casing onto the sausage stuffer. Keep natural casings moist. Knot the end then stuff with sausage mixture and tie off the other end of the casing. Twist into 8 links – or short (i.e. chipolata) or longer if you prefer. Remove any air bubbles by pricking with a sterilised needle or pin. Place finished sausages onto a plate, cover and refrigerate overnight before cooking. You can also cut links apart the next day to freeze in airtight containers for up to 3 months. TIP: Make one batch plain, cook, and taste, adjust the recipe (use the sausage-making record chart), then make more beef sausages, perhaps using some of the following flavour ideas.